Because some A2BO4-based materials such as (Pr,La)2(Ni,Cu,Ga)O4+δ exhibit high oxide-ion conductivity, scientists at Tokyo Tech have been exploring new structure families of ABCO4-based materials as BaRInO4, where R represents a rare earth element. Here, A, B, and C are cations located at different crystallographic sites, and A, B, and C in ABCO4 correspond to A, A, and B, respectively, in A2BO4. Many researchers have investigated the optical, electrical, and magnetic properties of CaFe2O4-type materials, but the CaFe2O4-type pure oxide-ion conductors have not been reported yet. Therefore, Professor Masatomo Yashima and colleagues synthesized a new CaFe2O4-type material, strontium ytterbium indium oxide, SrYbInO4. They investigated its crystal structure from room temperature to 1273 K, its temperature and partial pressure dependence of electrical conductivity, and oxide-ion diffusion pathways. The occupancy factors are also carefully refined using not only conventional X-ray diffraction data but also time-of-flight (TOF) and angle-dispersive-type neutron and synchrotron X-ray diffraction data in order to obtain reliable results. They demonstrate a partial Yb/In occupational disorder in SrYbInO4 through careful analyses of occupancy factors. Prof. Yashima and colleagues have chosen the chemical composition SrYbInO4, because it contains no transition-metal cation, which leads to less electronic conduction. Moreover, SrYbInO4 was expected to have the CaFe2O4-type structure in the structure field map shown in Fig. 1. 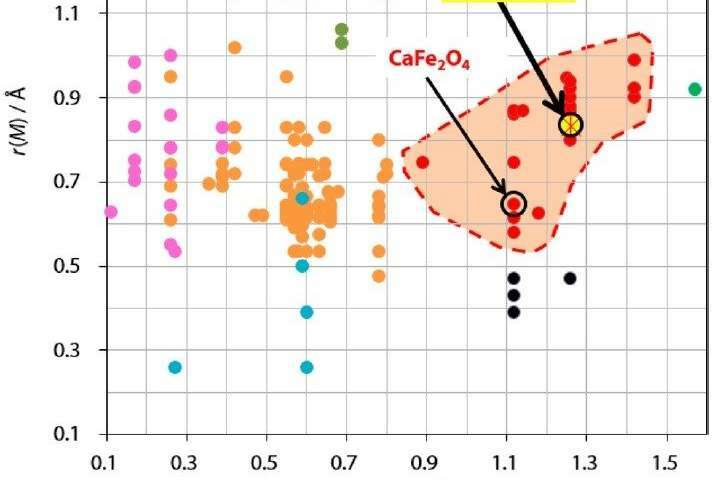 Ionic radii of Sr2+ and (Yb3+, In3+) are larger than those of Ca2+ and Fe3+, thus the SrYbInO4 is expected to have a lower activation energy for oxide-ion conductivity compared with CaFe2O4. SrYbInO4 was synthesized by a solid-state reaction. SrYbInO4 was characterized through X-ray diffraction, chemical analysis, and thermogravimetric analysis. The band gap of SrYbInO4 was also estimated using UV-vis reflectance spectra, which suggested that SrYbInO4 is an electronic insulator. 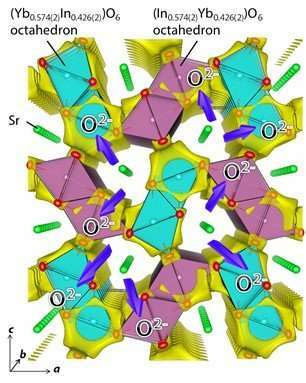 These results strongly suggested that SrYbInO4 was a pure oxide-ion conductor. Using neutron and synchrotron X-ray diffraction data and Rietveld method, Prof. Yashima and colleagues showed that SrYbInO4 is a single orthorhombic phase with Yb/In occupational disordering at the B and C sites, and no vacancies at the cation and oxygen sites. Bond valence sums and DFT-based structural optimization indicated the validity of the refined crystal structure of SrYbInO4. Therefore, the new material SrYbInO4 is the first example of pure oxide-ion conductors with a CaFe2O4-type structure. Further the temperature dependence of oxide-ion conductivity showed lower activation energy of SrYbInO4 (1.76 eV) than that of CaFe2O4 (3.3 eV), which was supported also by the bond valence-based energy calculations. The lower activation energy is attributable to the larger bottleneck size for oxide-ion migration due to the larger ionic radii of Sr2+ and (Yb3+, In3+) than those of Ca2+ and Fe3+, respectively. Prof. Yashima and colleagues claimed that the oxide ion conductivity of SrYbInO4 could be improved by doping, changing the degree of cation ordering and disordering, and using larger A, B, and C cations in the ABCO4-structure, which leads to further lowering the activation energy and higher oxide-ion conductivity. The findings of this study may open new pathways in the development of ABCO4-based ion conductors.